Remember that the fishing action really begins when the blue-winged olive nymphs, which are good swimmers, make their way from the stream bottom to the surface where they will emerge from the nymphal shuck as winged, air-breathing adults. Look for blue-winged olive emerger patterns in sizes 18-22 that utilize flashy synthetics .............. silver-lined glass beads. Besides giving the impression of movement and action, the flashy stuff also imitates the bright air bubble associated with a nymph as it heads toward the water's surface or as it begins to extricate itself from the shuck. 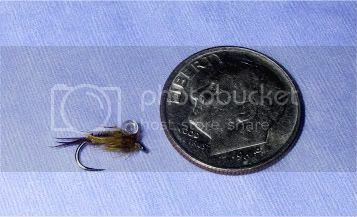 Here are two versions of a blue-winged olive emerger I tied using Ed's sliver lined bead method. 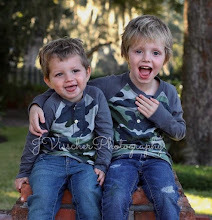 This first one is my sparse version. It's tied with a few woodduck flank fibers for a tail, a thread abdomen, dubbed thorax and a small, glass silver-lined bead. Here is a more robust pattern I tied using pheasant tail for the tail and abdomen (which is how Ed demonstrated the pattern), a dubbed marbou thorax (my addition), and the silver-lined bead. 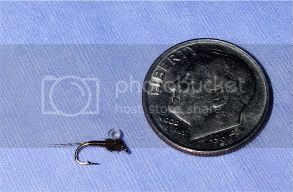 This one is tied on the Czech Dohiku hook. I've been using the dubbed marabou thorax on some of my emergers in recent years with good success. It makes a real messy, buggy thorax that "breathes" in the water. Give it shot and see of you like it. The beads in the photoslook like they are just clear glass, but they are silver-lined on the inside hole, and have a great flash to them. I use a piece of 6X tippet through the hole to bind them to the hook shank before I wrap the thorax material around the base of the bead and the hook. I'll report down the road on their effectiveness, or lack thereof, after I have given them a good soaking in front of some trout noses. Go get 'em! And sharpen those hooks. I'd seen the midge bubble back but was not sure what the BWO might be like. Nice use of dubbed marabou, think I'm going to try that. I suppose you could use ostrich for the thorax too. Where do you get the beads? Craft store or fly store? The marabou is just the fluffy stuff at the base of an olive dyed hen neck. Jimmy, I got them at Shannon's. They are called brite beads and are glass. I think Spirit River markets them. I'm sure Michael's has glass beads that are lined with various colors. And.....yes, ostrich may work nicely wound around the thorax.